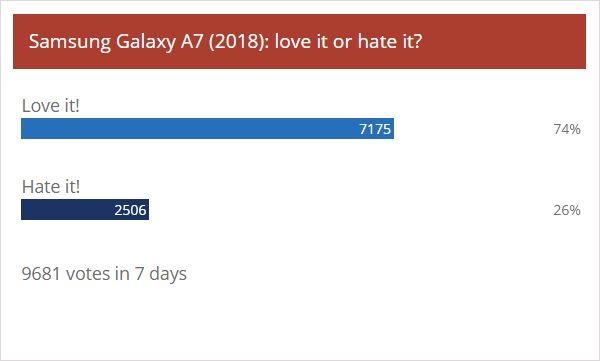 It seems that Samsung has brought in a winning mid-fielder  the Galaxy A7 (2018) got a 74% approval rating. This is a phone built around its Infinity Display and triple camera and the early response to them is a positive one. As expected, some people wished for more features  a tele camera and a faster chipset were the most commonly requested. We suspect those will be present on the Galaxy S10 instead, so there wont be any in fighting in Samsungs lineup. Plus, this A7 is a 350 phone, so it can get away with those. One warranted criticism was about the microUSB port  the switch-over to USB-C is already taking longer than it should have. Then again, some brands keep the micro port in similarly-priced phones (were looking at you, Oppo F9 and vivo V11). Those who love it will be able to snag a Samsung Galaxy A7 (2018) from Flipkart starting tomorrow (at a price of INR 24,000). Europe may have to wait until early October (which is far off). PS. there was some debate on the side fingerprint reader and how it relates to Sonys phones. Theres not a lot of clarity on that, when asked the Sony Mobile US representatives pretty much dodged the question.